Access to some of Cornwall's beaches has been improved for people with mobility problems. Three "sand chairs" will be located at Falmouth's Gyllyngvase beach, Porthminster beach in St Ives and Bude's Summerleaze beach this summer. 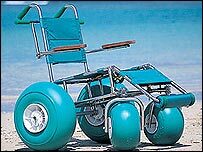 The chairs have titanium frames and wide wheelbarrow-type wheels and can cross most sand and shingle beaches. They were bought by Cornwall Disability Forum and the £7,000 cost has been met by the Cornwall Community Foundation. The foundation's funding comes from the Department for Education and Skills (DfES) Local Network Funds. A foundation spokesperson said: "Many people take accessing a beach for granted, but for disabled people it can be really difficult. "The sand chairs make a real difference by giving some disabled people the chance to experience the beach independently." The chairs can also be used out of season for activities such as abseiling.